It’s no secret that Samsung’s mid-range devices don’t get a ton of love when it comes to after-sales support. The Samsung Galaxy J7 (2016) may break that mold by becoming the first of the J-series to get not one but two major OS updates after its release. The phone originally launched with Android 6.0 Marshmallow, was later updated to 7.0 Nougat and should get 8.0 Oreo in December. This is months earlier than early information suggested. The Galaxy Tab A 10.1 (2016) (also originally with Marshmallow) is also set to receive Oreo in December (but the 7.0” model will die on 5.1 Lollipop). The Galaxy A8 is another 2016 device that launched with Marshmallow and is getting Oreo. Here’s the revised update schedule – there’s some overlap with the info from the Samsung Members app, but the launches are generally earlier. Note that the devices in bold launched with Marshmallow originally (the others are Nougat devices). 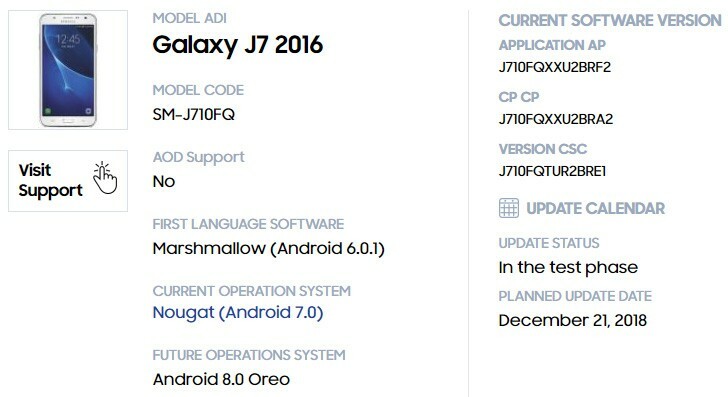 If you mean this Samsung Galaxy J7 Max: https://m.gsmarena.com/samsung_galaxy_j7_max-868­4.php then it gets Oreo in February. Any one else please use my previous 04 September link, peace. Lol j7 pro is getting the new os. How about j7 plus?